The foundation stones of Philippine Masonry were quarried in Spain and bore two Lodges in 1889 and 1890: Logia Revolución, in Barcelona and Logia Solidaridad, organized in Madrid. From these principal foundations was hewn, the cornerstone of true Filipino Masonry, brought to the Philippines in 1891. The first lodge organized was Logia Nilad, chartered by the Gran Logia Espanol in 1892; followed by Logia Balagtas where Apolinario Mabini, the brains of the revolution was initiated. Andres Bonifacio who led the first phase of the revolution in 1896 as Katipunan Supremo, was a member of Logia Taliba in Tondo while Emilio Aguinaldo, who became the president of the first Philippine republic in 1899 was made mason at Logia Pilar No 203 in Imus in 1895. 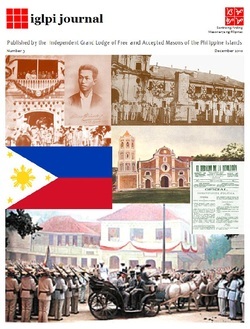 Philippine Masonry was therefore, born during the dawn of nationalism, when Filipino patriots were in the forefront of the search for a national identity. It became the inspiration in the fight for liberty, equality, brotherhood and justice; a struggle that started as a campaign for colonial reforms but later transformed into a struggle for independence that led to the establishment of the first Philippine republic in Asia.